Developed with simplicity and flexibility in mind. Control handle has no mechanical linkages or cables connecting it to the main body of the lifter. The handle simply adjusts the amount of atmospheric air that is allowed to bleed into the main body of the tube lifter. 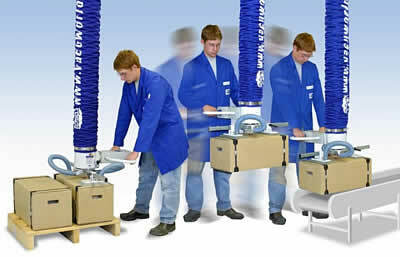 It is this bleeding effect that controls the raising and lowering of the load that is being held by the suction pads. When a load is hovering mid-air, the whole system is in a state of equilibrium – letting in just the right amount of air to maintain the correct vacuum level to lift and hold the load.